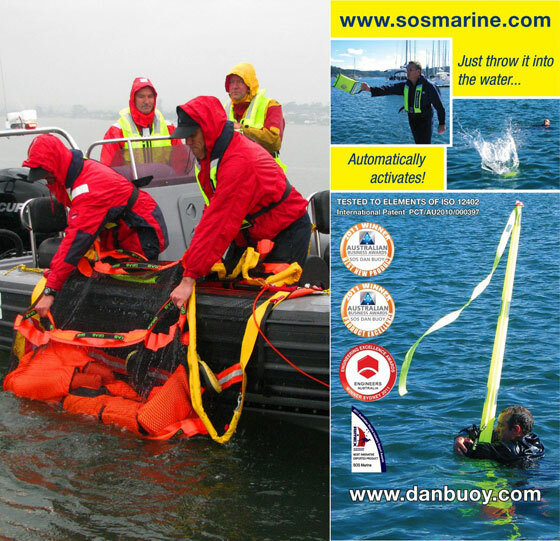 SOS Marine, an Australian manufacturer of marine safety equipment will be exhibiting two new man overboard rescue products at the DSA 2012 13th Defence Conference in Kuala Lumpur 16-19th April. The award winning SOS Dan Buoy and Sea Scoopa both provide a new level in operator safety and functionality for man overboard rescue. "These survival concepts set a new standard with many differential advantages and bring to the market-place pioneering ways to respond to an emergency situation" said a spokesman from SOS Marine. Based in Sydney, SOS Marine manufactures specialised lifejackets and safety equipment for 9 Naval Forces world-wide. The company has also develops a unqiue list of professional custom made products for the special forces and law enforcement agencies. SOS Marine has over 25 years experience of designing innovative products many with global patents to meet maritime safety solutions.